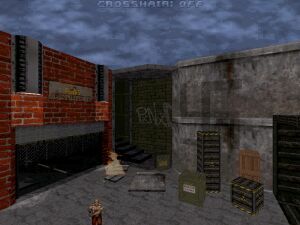 Who said you can't create World War 2 themed levels for Duke Nukem 3D? Well whatever you thought William Gee succeeded in creating a very good war themed dukematch level. Place is somewhere in Berlin where Duke clones are being created (these clones are human or bot players of course). While Duke fights, Allie fighters are destroying the city with bombs. There's a war going around the city so William has added some new ambient sounds which gives you a feel of war (gunfire & some old music). Design is impressive with ruined buildings, fires & 2-floor buildings. Weapon placement is good so bot play is fun. Definitely a level worth to download. Even if you're not a fan of dukematch or bot-play. Only minor problem is that with lots of bots it's difficult to hear any ambient sounds. So try it without bots as well.